This chapter is an Introduction to the book. We analyze a lack of intelligence as a major bottleneck of current dialogue systems, briefly survey current trends, discuss how to demo a chatbot and outline the pathway towards an industrial-strength one. The author is grateful to Dmitri Ilvovsky, Tatyana Machalova, Saveli Goldberg, Sergey O. Kuznetsov, Dina Pisarevskaya, Anna Parnis, Josep Lluis de la Rosa, Greg Makowski and other co-authors for fruitful discussions on the topic. 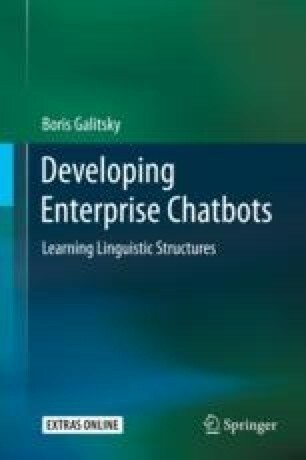 The author appreciates the help of his colleagues from the Digital Assistant team at Oracle Corp. Gautam Singaraju, Vishal Vishnoi, Anfernee Xu, Stephen McRitchie, Saba Teserra, Jay Taylor, Sri Gadde and Sanga Viswanathan. The author acknowledges substantial contribution of the legal team at Oracle to make this book more readable, thorough and comprehensive. Kim Kanzaki, Stephen Due, Mark Mathison and Johnny Tang worked on the patents described in this book and stimulated a lot of ideas which found implementation in this book. The work of Dmitry Ilvovsky was supported by the Russian Science Foundation under grant 17-11-01294 and performed at National Research University Higher School of Economics, Russia.